Everything you need to know about Google Play Protect & how to Protect your device! Android is often underestimated for its security flaws, but at the same time, it also has an arguable benefit of being open source ecosystem. However, we should accept the fact that Connected devices always need a robust security system to keep our data safe. 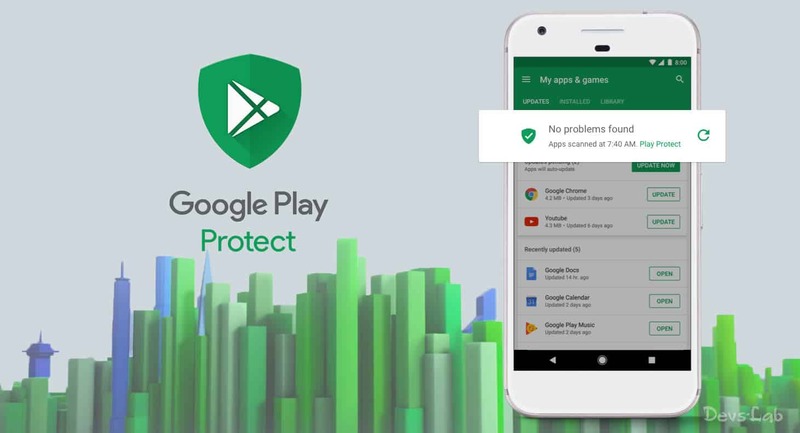 So, As a measure to increase safety on the Android, Google recently rolled out a new feature called ‘Google Play Protect’ to Android Devices. Google Play Protect feature will “Verify the Apps” installed on your device. This feature is recently rolled out for Android devices running Google Play Services 11 or later. Play Protect will be enabled by default, and a real-time malware scanner will scan every installed app on the device. So as long as you did not have a device running without Google Play Services, you should get this Google Play Protect feature. 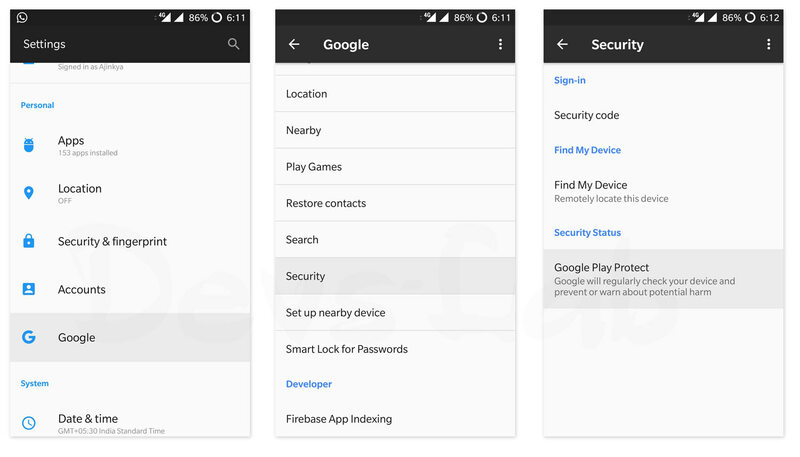 How To Check If Google Play Protect is enabled on Your Android Device? Step 2. Below the Option, you can see how long ago your apps are scanned and Tap on the Option to see the further details. Step 3. There is also an another option, “Improve harmful app detection“ which can be enabled. By allowing this, Play Protect will also scan the third part and manually installed apps. 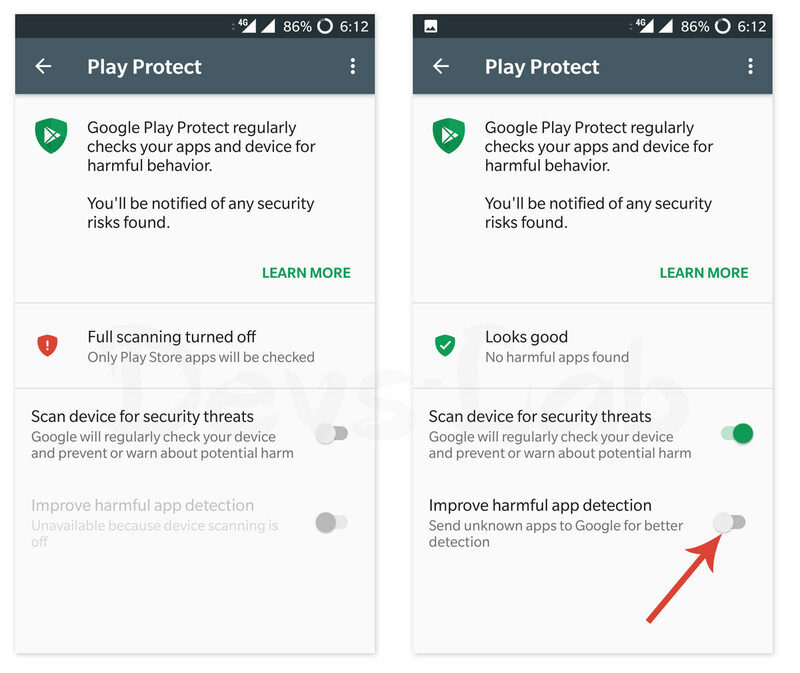 Google Play Protect is primarily designed to scan for malware apps on your device. And remember, It is not an antivirus or firewall which prevents the malware from third-party websites.However, this service will still alert you if you were about to install a dangerous/infected app from a third-party store. For this user should enable the “Improved harmful detection option” by going through settings as described above. In coming days, After the complete rollout of this future, Users will also be able to see a verification badge on the listing page of the apps on Playstore. Once implemented, this Safety pin comes handy for the users to get an understanding of security level of the app. Will Google Play Protect Prevent the Sideloading of APK’s? Many people are doubting if enabling the Google Play Protect will disable manual side loading of APK’s. As of now, it will not create any such restrictions. It is also difficult to speculate if Google has such plans in future, much like what Apple did with its ‘walled garden’ on iOS. But considering the fact that Android is an Open source Ecosystem, this may not happen shortly. How to disable Google Play Protect? Play Protect is enabled by default. However, users can disable it which is not recommended. If you don’t want automatic scanning the apps or want to disable it for a period, Users can do so by going through settings. Go to Settings -> Google -> Security -> Google Play ->Protect Scan device for security threats ->Turn off the Toggle. Finally, Google started to take Android security more seriously than ever. So, for many professional users, this is a welcome move in right direction. Also, this move from Google will help to take down the malicious apps on the Play Store. So, what do you think of this Google’s effort to stop Android malware? Do feel free to comment your opinions on Google Play Protect.